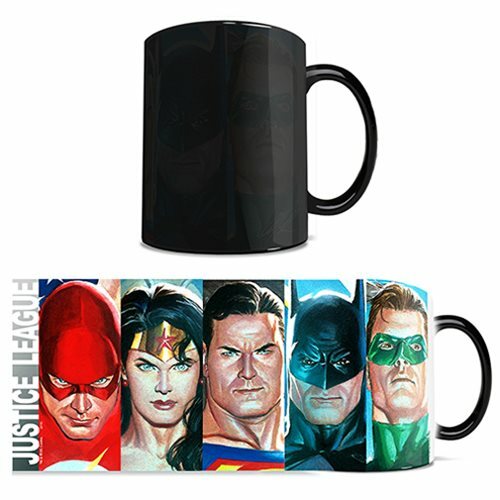 Amazing Morphing Mug features Justice League artwork by Alex Ross! Mug starts off black - the image appears when you add hot water! Start your day off the superhero way! Alone they are powerful… together they are unstoppable! The Earth's heroes gather to bring forth justice in an unjust world. Now you can own this amazing mug that proudly displays renowned artist, Alex Ross' vision of The Justice League. This 11 oz. Morphing Mug transforms from black as hot liquid is added! Ages 14 and up. Watch as the heat-activated process reveals the hidden image in full vivid colors!